These days, the path for many -- both fans and players -- to the jazz guitar comes through rock. And increasingly jazz guitar is being taught in schools and conservatories, where hotshot rock players who find themselves outgrowing the heavy metal stage are being turned into jazz scholars. And with that academic background has come a generation of technically proficient guitarists who nevertheless can often sound similar to each other. Once the rule in jazz, largely self-taught jazz guitarists are a rarity. By age 15, Cheshire was performing professionally at little wine and cheese places on Long Island, playing standards in a trio, and learning on the gig how to swing. Since his last guitar lesson was 22 years ago, he learned jazz the old-fashioned way. Still in his teens, he moved to Brooklyn and attended every jazz jam session he could, and going through the often painful process of discovering just how much there was to learn about playing, improvising and rhythmic feel. His initiation rite into the jazz world came in the form of a tune that was virtually required of every jazz player in the 1970s On Green Dolphin Street. He knew he was a in when after the set one of the cats came up to me and said Hey Kid, you finally learned how to play Green Dolphin Street, huh? It was around this time that Cheshire started composing. It wasnt long before Cheshire had opportunities to play with Kenny Barron, Roy Haynes, Buster Williams, Dewey Redman, Harold Mabern and a host of others. After some five years off from playing, following marriage and a non-musical job, an invitation from a drummer in a West Indian-style band led him to take up his guitar again, eventually leading to performing with the Walter Perkins Quartet among others. Along the way, his musical growth was documented though a fascinating body of unreleased recordings of funk, spacey explorations in odd time signatures, along with some straight-ahead sessions. Tiring of the environment in Brooklyn, Cheshire and his family moved to rural Milanville, PA, on the Delaware River, where he has been perfecting his craft, widening his musical vision, composing steadily, and becoming a downright fine guitar player with a distinctive and original approach. It was during this period when I first encountered Andrew, inviting him to appear on the Homegrown Music regional-artist series I produce for public radio station WVIA-FM, Scranton/Wilkes-Barre, PA. His innovative, mostly single-line soloing style combined his harmonic originality in original compositions and in fascinating reharmonization of standards, made it quickly evident to me that Cheshire was a guitarist/composer outside the ordinary mold. In 1996, Cheshire recorded his first CD This Is Me (Joule Records) with a stellar quartet featuring the redoubtable Ron McClure on bass, Don Friedman on piano and Matt Wilson on drums. It showed Cheshires sure hand at composing, with tunes notable for a combination of lyrically attractive melodic lines with the sophisticated harmonic progressions that mark the best in jazz writing. He brought a guitar style to match: warm, tasteful, inventive and expressive. 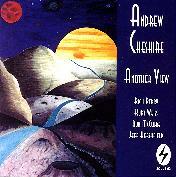 The CD illustrated Cheshires single-line dominated style, which meshed beautifully with Friedmans lush piano. The CD combined seven fine Cheshire originals with a classy readings two standards. Now comes Another View, which is just that: a different facet of Cheshires composing and playing, performing in a piano-less quintet, aiming for a feel like some of the classic old Blue Note sessions, but with fresh, new music. Once again, Ron McClure, bassist extraordinaire, who will forever be remembered on Charles Lloyds enormously popular Forest Flower sessions, returns, joined by the ubiquitous and enormously tasteful drummer Jeff Hirschfield. The horn section includes tenor man Rich Perry, a veteran of his own albums and known for his graceful, soaring solos with the Maria Schneider Jazz Orchestra. Perrys solo work on Another View is nothing short of phenomenal. On trumpet is up-and-coming Delaware native Kurt Weiss. Based in New York for the past eight years, Weiss career has been diverse enough to include stints with Ray Charles, Natalie Cole, the Glenn Miller Orchestra, and his own group. On this, his first straight-ahead jazz session, Weiss solos with authority and a sense of clarity and focus that mark him as a player likely to be attracting a lot of attention. The album title also is relevant to the instrument Cheshire employs. Originally planning to record on an acoustic guitar, Cheshire decided the day before the session to use a solid-body guitar more associated with rock, complete with whammy bar, which he put to creative use. His sound this time around combines hints of high-tech contemporary elements with the warmth of traditional electric guitar. He also takes a somewhat different stylistic approach for this session, playing more chords during solos, while still turning out those single-note lines that brim with intriguing octave jumps, unexpected melodic lines and flourishes of triplets. Cheshire really blossoms as a composer for this session, with the material running from exploratory modal pieces to wonderfully melodic Latin-influenced. The former is the focus of the title tune. Another View is based on the tritone interval (which precisely divides the scale), that Cheshire calls a parallel universe in which I can explore two worlds at the same time, The composition shows some of Cheshires interesting ensemble writing for the horns, heard throughout the album, with horn and guitar lines weaving in and out of each other. The track features the CDs most exploratory solos by Perry, Weiss and especially Cheshire. Tomorrow Is Today, based on a laid-back Latin rhythm, subtly delivered by Hirschfield, provides a vehicle for a gorgeous solo by McClure, followed by Cheshires almost playful outing that throws a few little musical jabs into an otherwise flowing, lyrical setting. Weiss and Perry make the most of fairly succinct solo opportunities. Earth Dance pirouettes back and forth between waltz and swing time, and features a melody line Cheshire structured to take advantage of the natural sonority, ebb and flow of the horns. Perry really sinks his teeth into this harmonically fascinating tune in his brilliant solo. Eva, named after Cheshires wife, is also based on a Latin rhythmic figure. In its theme the harmonic lines are passed back and forth between the horns and the guitar, while the other plays unison figures. If Secrets resembles the old Blue Note sound, its intentional. Cheshire aimed to provide a more standard structure to this piece, without sacrificing the harmonic interest. It provides a strong vehicle for blowing: Perry shines, Weiss burns, and Cheshire soars. Saturn was born first of a melody line, around which the interesting, often unexpected harmonies were woven. The ensemble lines are a showpiece for Cheshires fine writing. Twentieth Century composer Béla Bartok was the inspiration behind Diverge. Bartoks technique of having the melodic line separate into ever wider intervals provides the basis for the piece (and its title), based on the Phrygian mode. Cheshire makes the most of the diverging line in his memorable solo. The track also includes a fiery solo by Hirschfield. Love Planet embodies a wonderful laid-back feel, again with some great ensemble writing for the horns, with the trumpet and tenor moving in and out of a rhythmic counterpoint. The shifting harmonic colors of the piece, with its transitions to 3/4 at the end of each chorus, gives Perry, Weiss, Cheshire and McClure get a chance to do some of their most appealing solos on the record. Cheshires solo aptly spotlights his technique of implying the chord changes mostly through single note lines, beautifully supported by McClure. As a composition, its got everything a jazz musician would want, and given enough exposure, could easily become a standard. While prestigious institutes of higher learning are turning out some guitarists of formidable ability, its nice to know that someone like Andrew Cheshire can come up the old fashioned way and create music no less edifying, while bringing the distinctive style and personality that comes from finding ones own way. To George Graham's Producer's Page | To George Graham's Home Page. | What's New on This Site.